Hello, Id like to book a deluxe room for October 29,2011. 4 of us will be staying overnight so please do email me if its possible. Thanks a lot! pls. send me your room rates for 2-3 persons for nov. 23-26. thanks! We would like to set a schedule for our vacation in your resort on sunday (April 10, 2011). Hope you will accomodate us. Pls. send room/cottages rates. Thanks! pls email me room rates and price list for guimaras land tour and island hopping... hope to her from you soon..
can u pls. email me ur rates for a family cottage on april 2010.is there any public transportation straight to ur ressort from pantalan? thank you looking forward to hear from you..
hi can you email me the room rates coz im planning to go to guimaras this coming september please email me the room rates of your diff. 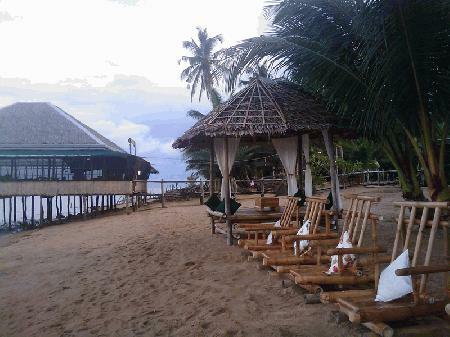 cottages and amenities... ilang minutes travel time from ilo-ilo city to your resort?? thank you and more power. Hi, Good Afternoon! I would like to inquire if you have available room good for 2 pax, rate?? Also, how long is the travel time from Iloilo city to your resort? Hope to here from you soon! Thanks! hi.gud day! !..can u pls send me ur room rates?do u have available rooms on april 15-16?thank u.. Please send me your room rates & amenities for an overnight stay on April 1, 2009. How do I go to your resort from Iloilo? im glad to visit the most beautifull islands around in the philippines. can you please send us your complete list of facilities and rates. we are looking for a place to shoot for our promotional project. we're from west visayas state university. thanks. just would like to ask about your room rates and available amnties..
do you have a more comprehensive room rates? including restaurant rates?